Renowned in legend and history, by a variety of names—Kōna Malai, Kōnā Malai, Tiru Kōna Malai — Trincomalee is the site of the "Sacred Hill of the Three Temples." Situated on the eastern seaboard, the place finds mention in the Mahavamsa by the name of Gōkarna, the Sanskrit and Pali form of the Tamil KONa or Sinhalese GOna. 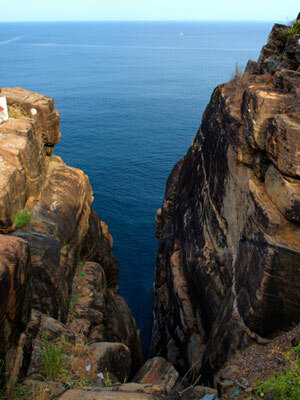 The site of the ancient Tiru Koneswaram Temple upon Swami Rock, Trincomalee. Modern-day Tiru Koneswaram (திருக்கோணேஸ்வரம்) Temple may be seen in the background. On the summit of the Rock, known as the Swami Rock or the Three Swami Rock, was the "temple of unusual size and splendor, renowned through the whole of India," the temple which was razed to the ground and despoiled by the Portuguese in 1624. Tirujnana Sambandar the Saivite saint of the 7th century AD features the temple in his devotional hymns. This is the earliest reference to the temple, which in point of time goes back to a far distant epoch. The Pallavas of South India had considerable influence over the region, in the time specifically of the King of Ceylon, Manavanna (668—703 AD), as we learn from the Sanskrit inscriptions at Tiriyayi, 29 miles north of Trincomalee. From this and other related accounts, it is reasonable to conclude that the Pallava kings bestowed much attention to the temple dedicated to Koneswara (திருக்கோணேஸ்வரம்) and enlarged it considerably. From references to the "Thousand Pillared Mandapam," it was obviously a shrine of magnificent proportions.  The Chola and Pandyan kings maintained the traditions of royal patronage. The inscriptions at the archway of Fort Frederick with the insignia of the double fish symbolism of the Pandyan kings, are eloquent of the Pandyan connections ascribed to the 13th century. "In the earlier portion of their career in Ceylon the Portuguese showed the utmost indifference to the possession of Trincomalee; but after the appearance of the Dutch on the coast and the conclusion of an alliance between them and the Emperor of Kandy, Constantine de Sa, in 1622 alarmed at the possibility of these dangerous rivals forming establishments in the Island, took possession of the two ports of Batticaloa and Trincomalee, and ruthlessly demolished the "Temple of a Thousand Columns," in order to employ its material in fortifying the heights on which it stood. Some of the idols were rescued from this desecration, and conveyed to the Pagoda of Tamblegam; but fragments of carved stone-work and slab bearing inscriptions in ancient character, are still to be discerned in the walls of the Fort, and on the platform for the guns. 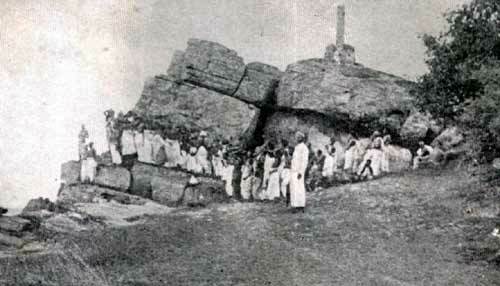 The scene of this sacrilege is still held in the profoundest veneration by the Hindus. 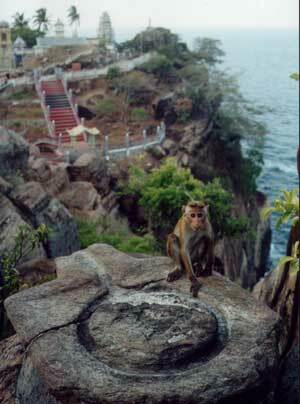 Once in each year, a procession, attended by crowds of devotees, who bring offering of fruits and flowers, repairs, at sunset, to a spot where the rock projects above the ocean—a series of ceremonies is performed, including the mysterious breaking of a cocoanut against the cliff; and the officiating Brahmin concludes his invocation by elevating a brazen censer above his head filled with inflammable materials, the light of which, as it burns, is reflected far over the sea." (Tennent's Ceylon, Vol. II, pp. 484-485). The destruction was so overwhelming that objects hurriedly hidden, or submerged under the debris or consigned to the sea, continue to be revealed from time to time. Among such are the three images discovered on a day in July, 1950—Siva as Chandrasekhara, Siva as Somaskanda, and Parvati. These with the four figures discovered earlier, including figures of Ganesa and Parvati seated, make a total of seven images. Undersea explorers have recently taken submarine photographs of the place using high tech cameras, and incidentally discovered the remains of the ancient Hindu temple deep down near the seabed. Taking a picture in such a depth can ruin a camera if you are not careful; you are certain to need a camera repair shop if you do not take the proper precautions. The temple is now in process of reconstruction, after a lapse of some 380 years following its destruction. A number of structures have already come up and the work is proceeding. 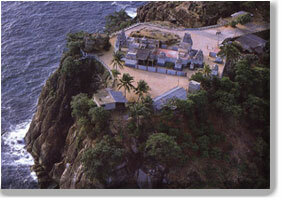 Trincomalee and its environs are sacred to the Buddhist as to the Hindu. Tiriyayi 29 miles north of Trincomalee is a place of Buddhist interest. Here has been discovered the ruins of an ancient Buddhist monastery, with the standing structure of a vatadage, an architectural type, distinctively Sinhalese, occupying an area of about an acre in extent. In the centre of the premises is the ruined stupa. Below the hill extends to the East, the blue sea—the Bay of Bengal and an unbroken stretch of forest on all the other sides. A Sanskrit inscription on a rock gives the name of the shrine, the Giri Kandi Caitiya. The shrine is of great value to the Buddhists, for within it is believed to have reposed the very first relics of the Buddha. At the four entrances to the shrine are moonstones of high artistic merit. Among the other striking features are the guard stones of the makara and the naga. To begin with features sacred, is not to belittle or depreciate the other manifold fascinations of Trincomalee. Nature has endowed the region with a beauty and grace that has not been excelled by man. No doubt, man here has enriched Nature's gifts, so much so, that Trincomalee today is a product of both aspects harmoniously blended. Its importance as a place of strategic consequence guided its destinies in modern times. The great European powers vied with one another for the mastery of the harbor. The Portuguese, the Dutch, the French and the English, each held it in turn, and many a sea fight was staged off the cliffs of Trincomalee. Of all harbors in the East, it can be said that it is largely today as Nature endowed it. Commanding the finest view in all the station, are the terraced high lands overlooking the harbor—the site on the eminence of which stands the most commodious and attractive of the hotels of the place, the Welcombe Hotel. Below stretches in all its splendor the placid waters of the harbor, with but the gentlest of ripples playing over its surface as the soft wind blows over its wide expanse. To all appearance, more a lake set in natural surroundings, than an inlet of the sea, the view of the harbor from the terraced premises of the hotel is a sight most refreshing, physically and mentally. Guarding the entrance to the harbor are the pair of projecting headlines, much as the twin figures of dwarapalas at the entrance to one of the temples of Anuradhapura. It is the temple of Nature that these headlines safeguard. Far away in the distant horizon is a thickly wooded strip of land which "connects the landscape with the quiet of the sky." Irregular in outline all around as Nature made it, this enhances the charm of its setting. A carriage road winds along the northern and eastern sections of the harbor. The situation of Trincomalee in an environment comparatively less developed and sparsely populated, has been a handicap in the past ages, to its advancement. 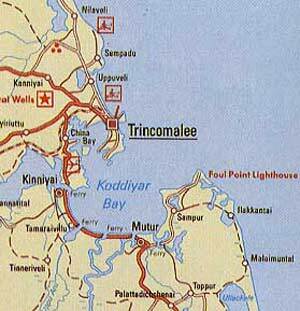 Nevertheless plans to develop Trincomalee as a commercial seaport are under way. These hold forth rich promise of brighter days. Its gifts as a natural harbor may ere long bear fruit, as a commercial port of immense consequence to the economy of Ceylon. Among the sights of the place are the seven hot springs of Kanniyayi, on the road to Trincomalee. About a mile on a side road branching from the main route, the springs are worth a visit. A high wall assembles all the seven springs in a rectangular enclosure. Each enclosed in a dwarf wall forms a well of its own. The water is mildly hot; the temperature varies but slightly in each. 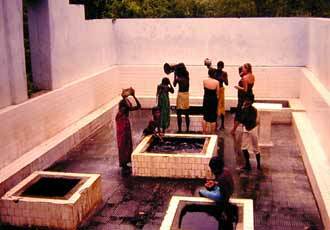 In effect, a public bathing resort, the use of the springs is controlled by the neighboring Mari Amman Kovil who holds the lease of the wells. The site of the springs is crown land.